Ayatollah Khomeini's Promises 30 Years Ago at Behesht Zahra Cemetery. Thirty years on, the reality is very different from those promises made by Ayatollah Khomeini. Not only Iranians didn't get free telephone, heating, electricity and bus services, but the standard of living for Iranians compared to the other oil producing countries in the region drastically deteriorated. Soon after the mass executions of the former regime officials, the revolution started devouring its own children. One by one former supporters of the revolution which were no longer required were eliminated. 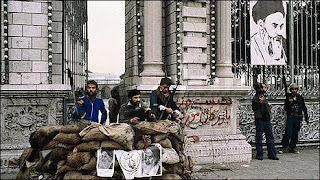 The MeK, seen in the above picture guarding the barricades to the Prime Minister's Palace, the Communists, the remnants of Mossadegh supporters in the National Front, the more liberal Islamists and right up to even those amongst the Shiite clergy who did not want to toe the line, one by one fell victim of the revolutionary elimination process. The result of all this elimination is in tens of thousands of Iranian lives with its climax in 1988 when thousands of political prisoners, who had survived earlier bloodbaths, were massacred. The emasculation of the powerful Iranian army after the revolution, which up till then had stopped Saddam Hussein's every aggression on the Iranian soil, emboldened the Ba'athist regime to invade Iran. Over a million Iranians were killed and maimed in an eight year war that was unnecessarily prolonged with no tangible gains for either side. Millions of Iranians who could not tolerate the new repressive Islamic measures left the country which resulted in the biggest exodus from Iran ever since the Arab invasion thirteen centuries ago and the brain drain continues today. Not only no spirituality was gained but the country has suffered a rapid moral decline. Government's own figures show an alarming rise in prostitution, drug addiction and crime. At one point the school children were even asked in their classrooms to snitch on their parents and friends if they seemed to deviate from the revolutionary guidelines. Not only the political freedoms we seeked did not come about, even our personal freedoms were taken away. We were told what to wear, what to drink, what to eat, what to listen to and what to enjoy and what not to enjoy. Iranian instinct for survival and resourcefulness however has fought back. Bit by bit Iranian women have fought for their rights and the restoration of the rights they had before the revolution. Their resistance has meant that the Ayatollahs have been unable to push Iranian women to the status of Saudi women. The young, the students and the intelligentsia have seen the errors of the past generations, they no longer think the same as their previous generation. Technology makes them even more aware of what they are missing and how their counterparts enjoy life and freedom in the rest of the world. The workers, the teachers and the dispossessed are no longer swallowing the false promises and waiting for free goodies to be delivered, they are demanding their rights and their leaders remain defiant in jail. After thirty years of elimination and brainwashing to destroy the Iranian identity and our joyous culture, the struggle continues. Our country has seen even worse and more savage invaders than these and has survived. This dark era will just be a storm in the tea cup in the Iranian history. There are many things which are hindering the Iranian nation however, whereas thirty years ago it was the Iranian Left who helped the Ayatollahs to take over the power, now it is the international Left which is helping the clerics remain in power, the 'useful idiots' and the spineless Western leaders who see no further than their short term interests, the proxy terror groups in the region and the unscrupulous turncoats are all desperately hand in hand trying to keep this antiquated regime on its life support but it will be all in vain. Iran will survive and Iran will come through victorious as it has throughout the past. Let's hope Iran will be victorious; these disease-ridden rats (ruling elites in the IRI) infest government buildings, police force, judiciary and even the family home. They gain support from various western states in the form of back-stage agreements. With such support, it will be tough to overthrow them; however, the effort in doing so is worth it - for that glimmer of hope that one day we or our children will return to a free and democratic Iran, paying homage to Cyrus the Great, in celebrating our true heritage.